Newly developed Multi patches take full advantage of new S.A.G.E.™ (Spectrasonics Advanced Groove Engine) technology with multitrack grooves which show the full potential of Metamorphosis Grooves with Stylus RMX. Extraordinary 21st Century Grooves from acclaimed producer Eric Persing. 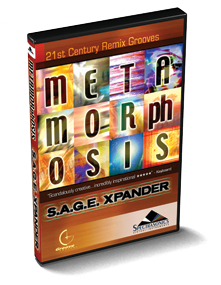 The award-winning Metamorphosis features a vast array of highly creative remix grooves that defy description. Great for any projects that require cutting edge sound, yet timeless grooves. Mixes very well with the Stylus RMX core library and has a large selection of suites to build your own remixes. Like his famous Distorted Reality series, Metamorphosis is a testament to Persing's inimitable style! This awesome demo was done as a collaboration with our friends at Access Music in Germany. All the synth sounds are coming from an Access Virus synth and all the rhythm is coming from the Metamorphosis library in Stylus RMX Xpanded. A killer combo! This demo features the Metamophosis grooves from Stylus RMX Xpanded accompanied only by Vocal Planet phases. This demo features grooves from the Metamorphosis section of Stylus RMX Xpanded, Vocal Planet phrases and numerous evocative textures, boys choirs and sounds from Omnisphere. Features grooves from the Metamorphosis section of Stylus RMX Xpanded, phrases from Vocal Planet, Bass Legends muted basses and numerous sounds and textures from Omnisphere including the lead Electric Sitar melody. EP's Funky Electro R&B demo highlights Metaphosis grooves in Stylus RMX Xpanded and phrases/fx from Vocal Planet. "Amazing, description-defying sounds on this bases-loaded, outta-the-park home run collection...scandalously creative sound design...everything from sizzling electronic and ethnic-sounding percussion loops to gut-busting kicks that thump out of the speakers with all the angst of an Outkast cut. The sound quality is top-notch throughout...The loops are not only impressive from a production standpoint, they're incredibly musical and inspirational, which is why we've given Metamorphosis a Key Buy." "We are already TOTALLY digging Metamorphosis!" "There's far more here than just a collection of gritty, scratchy old funk rhythms with a slight swing. There's distortion, filtering, extreme effects and synthesized sound — the list of gear used in the creation of the samples extends to two pages of hardware and software. This is not a night out with an HR16 and a Quadraverb! The degree and type of processing varies enormously throughout the library, but at no point are the loops rendered unusable through over-zealous mangling. The loops really groove nicely, while the processing gives them character and depth that would be very hard to find from any other source." "The important thing about Metamorphosis is that the loops work, they sound fantastic and if used properly, they don't overwhelm. Metamorphosis is another superb effort by the Spectrasonics team that should most certainly be in any electronic composers' creative sound palette." "Absolutely brilliant...I was looking for some loop-based material to make a song backing track more dramatic and interesting. Within 10 minutes of working with 'Metamorphosis', I'd found three or four loops that exactly fitted the bill. After an hour, I'd found so much useable material that my mind was beginning to boggle! I really like the way Eric Persing uses distortion and phasing, but somehow manages to maintain the loop's sonic integrity. The end result is exactly to my taste, powerful without being overpowering, funky without being clichéd. I don't know exactly how he does it, but I do know it would take me weeks to get anywhere near the same effect! My congratulations for making the world of sampling inspirational again." "Persing has set the standard for how groove libraries should be done....Inspiring."